Legalization and its Effects on Employers | Building A Safer Evansville, Inc.
Having workers able to smoke marijuana, even off the job, could create risks and confusion in the workplace. Federal and state laws conflict concerning marijuana usage. Marijuana is illegal for all purposes under federal law; however, many states have passed laws that would allow recreational and medicinal use. Employers across the United States are asking how marijuana usage should be handled in the workplace. For example, unlike with alcohol, employers have no means to determine whether a positive drug screen is the result of an employee’s off-the-clock use of marijuana or current intoxication. Most employers maintain some form of drug-free workplace policy. Legalizing marijuana is only going to increase the number of people who cannot pass pre-employment and random drug tests. Workplaces are still going to demand a safe work environment for their employees. 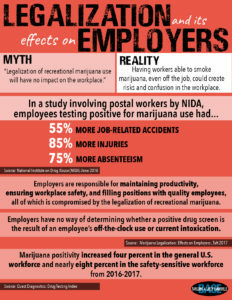 In fact, in a study involving postal workers by NIDA, employees testing positive for marijuana use had 55% more job-related accidents, 85% more injuries, and 75% more absenteeism. In conclusion, employers are still responsible for maintaining productivity, ensuring workplace safety, and filling positions with quality employees, all of which is compromised by the legalization of recreational marijuana use.